The Children’s Foundation of America would be nothing without the volunteers that support us in our mission to help children heal, learn and thrive. The aid of our amazing volunteers makes the work we do possible. 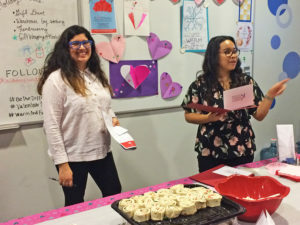 To show our appreciation, the Foundation hosted their third annual “Valenteer” Party on February 23 to highlight the achievements of our volunteers and award those who stood out as invaluable members of the community. 2018 stands as a year of many accomplishments. 596 individual volunteers supported the Foundation for a total of 1,645 volunteer hours. That’s 196 more volunteers and 245 more hours than the previous year! 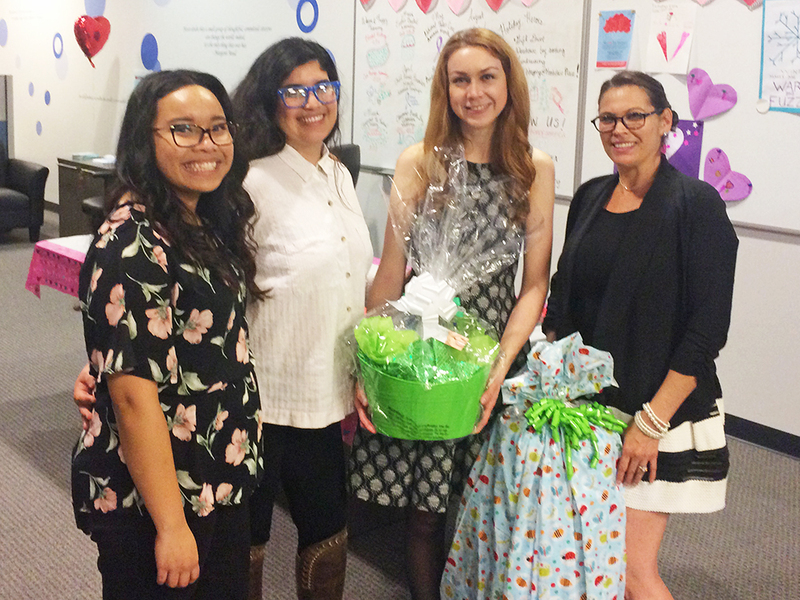 The items we’ve collected from donation drives allowed us to support foster youth in a multitude of ways. We were able to grant a total of $55,000 in scholarships and provide basic necessities like contact lenses and blankets. Through funding we were able provide a sense of normalcy for several foster youth. We purchased a prom suit and interview clothes for a young man in a group home, provided the opportunity to take college preparatory classes, supplied a therapist with weighted vests for children dealing with trauma, and much more. All of this wouldn’t have been possible without the help of volunteers donating their valuable time to make a difference. Volunteers were treated to a variety of food, from cookies and cupcakes to chips and sandwiches. All of this thanks to our generous donors Stater Bros., Von’s, Espiau’s, I Like Pie Bakeshop, Trader Joe’s and Super King. Attendees were given raffle tickets to win a variety of prizes, ranging from free tickets to our annual Funny 4 a Reason comedy show to Jamba Juice and 21 Choices gift cards. Additional raffle tickets were given for donating to our Birthday in a Bag campaign, which collected $250 worth of birthday items for foster youth. One of our lead volunteers, Vicki Rensch, donated 6 birthday bags and won a Starbucks gift card and a Palm Desert Jeep Tour voucher! 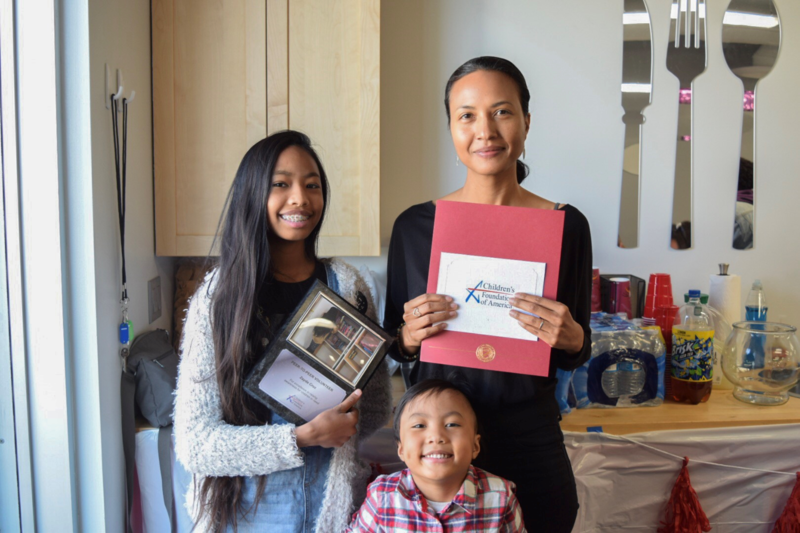 Communications and Volunteer Relations Specialist, Marie Maghuyop and Community Outreach and Donor Relations Coordinator, Amber Thorneycroft passed out special certificates, plaques and trophies to recognize the time and dedication of our volunteers. 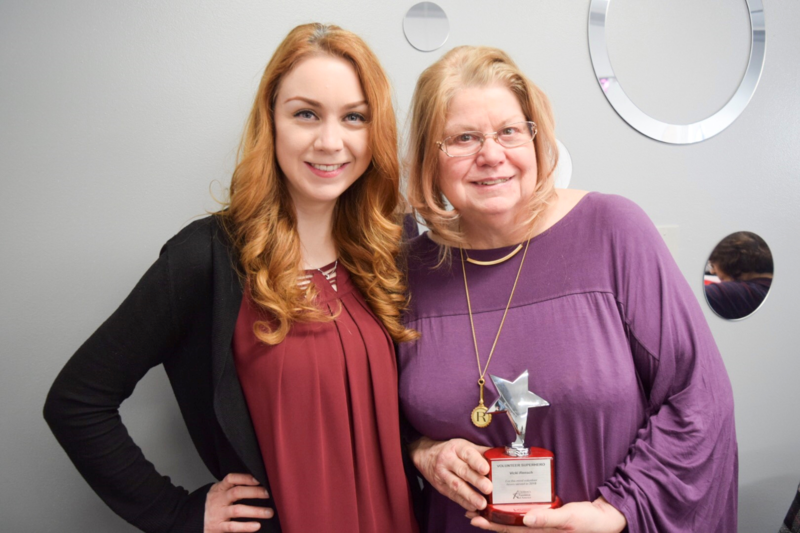 Among the unique awards presented, were “Volunteer Superhero” trophies, awarded to Jim Athey and Vicki Rensch for accumulating the most amount of volunteer hours in 2018. 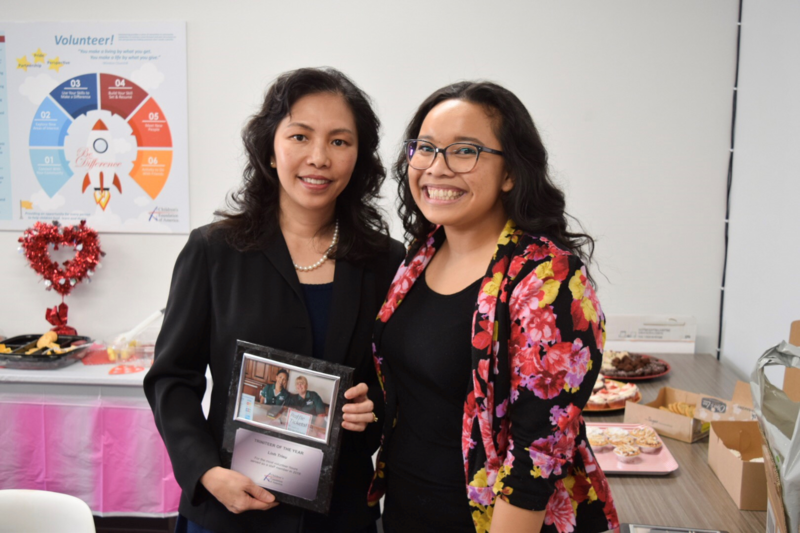 Volunteer Linh Trieu received the “Triniteer of the Year” plaque for serving the most volunteer hours as a Trinity Youth Services employee. 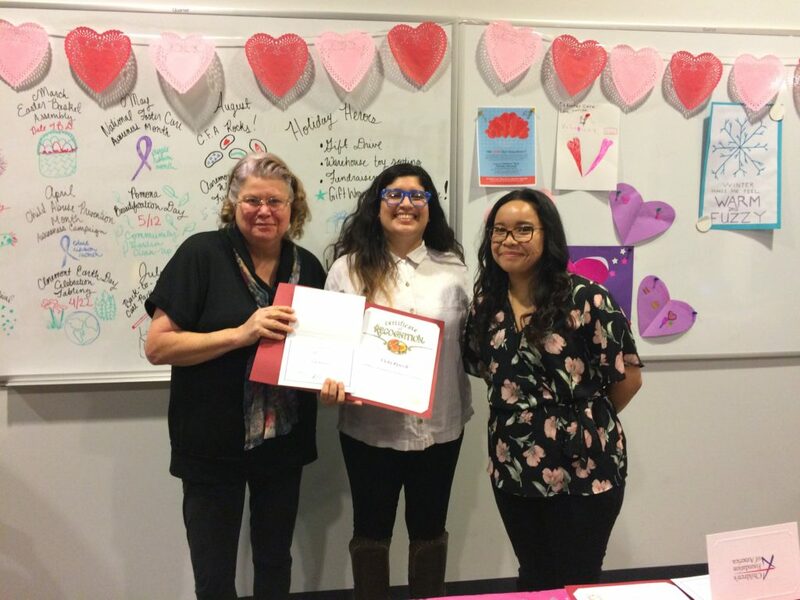 Zayda Cruz was presented the “Peer-to-Peer Volunteer” award for her outstanding work in conducting book drives and raising funds for a literacy scholarship. As part of the Zayda Literacy Fund foster children at Trinity Youth Services are eligible for up to three $500 scholarships and book packages. 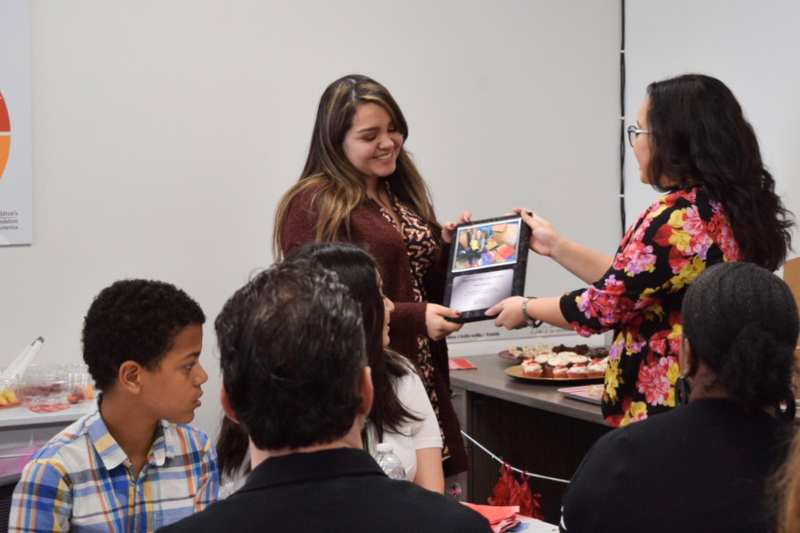 Although unable to attend the event, the Etiwanda High School Key Club received the “Superhero Squad” award for serving the most volunteer hours as a group. Dania Aguilar, a previous intern and long-term volunteer, received the “Most Valuable Volunteer” award for going above and beyond. She continued to volunteer after her internship, helped raise awareness of our organization and brought in more volunteers. Thank you to all of our amazing volunteers for making 2018 another successful year for CFA! We look forward to seeing what we can accomplish together in 2019. If you would like to know more about getting involved, click here! 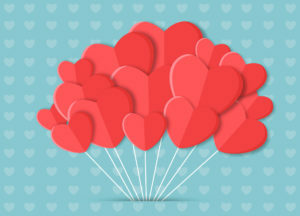 Our 3rd Annual “Valenteer” Party! You are cordially invited to our 3rd annual volunteer appreciation reception on Saturday, February 23 to recognize our amazing volunteers, celebrate our successes and find out what’s in store for 2019! Whether you’re a current volunteer or interested in getting involved, join us at our office to meet the Foundation staff, members of the board of trustees and other volunteers. Enjoy refreshments, goodie bags, raffle prizes and awards! 1 ticket per completed birthday bag donated: Must include gift bag, cake mix, frosting & any 3 of the following: birthday decorations, streamers, candles, plates, cups, napkins, utensils. 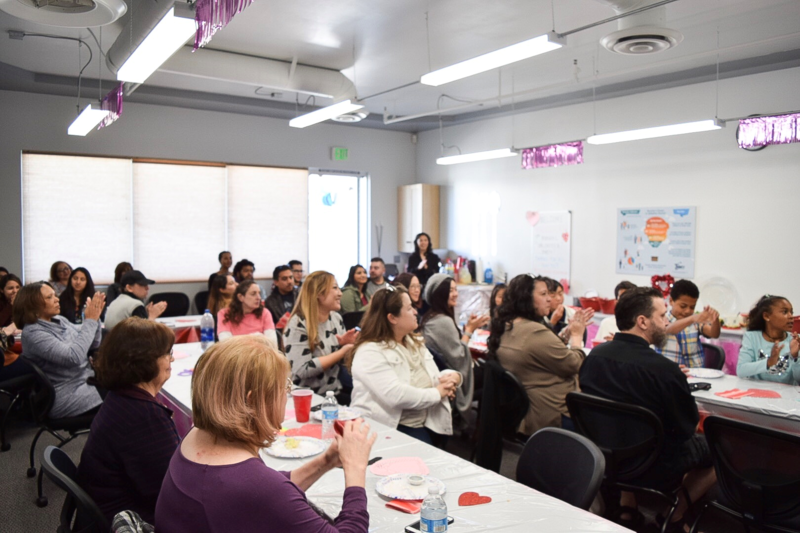 On February 8, we hosted our 2nd annual “Valenteer” Party celebrating a year of tremendous growth and success in 2017. 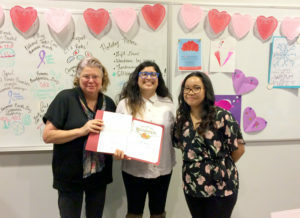 To show our volunteers our love and appreciation, we decorated our office with Valentine decorations, provided refreshments, conducted fun activities and handed out certificates to volunteers who went above and beyond in 2017. 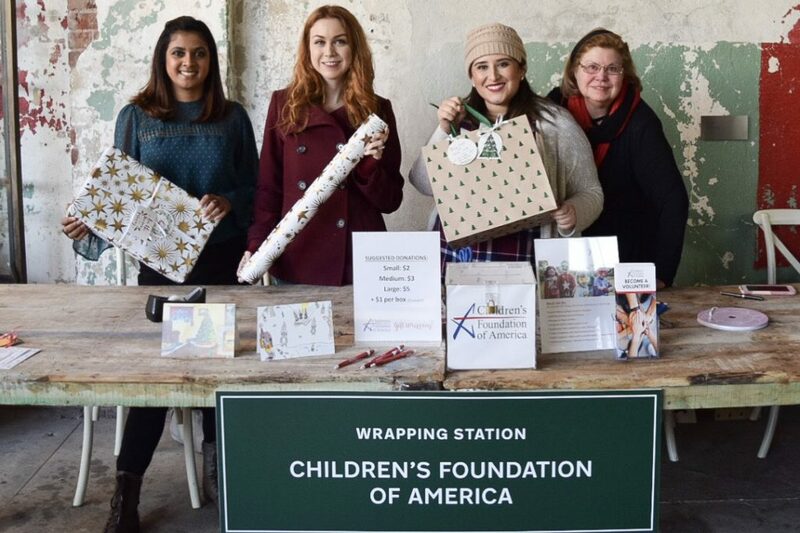 The Children’s Foundation of America would be nothing without the support of the community and our wonderful volunteers because they believe in our mission to help children heal, learn and thrive. 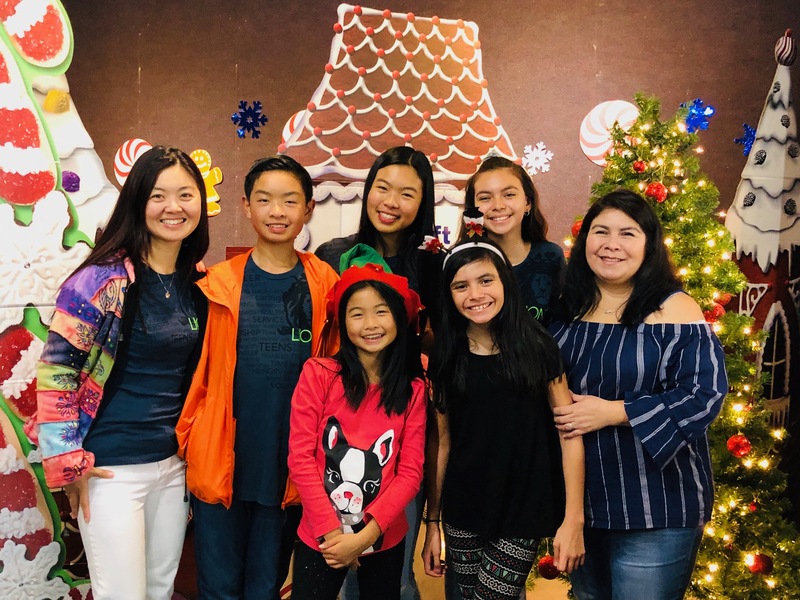 Thanks to the combined efforts of over 400 individual volunteers (more than double from 2016), the Children’s Foundation of America was able to provide care packages for 3,400 children in foster care and homeless shelters. 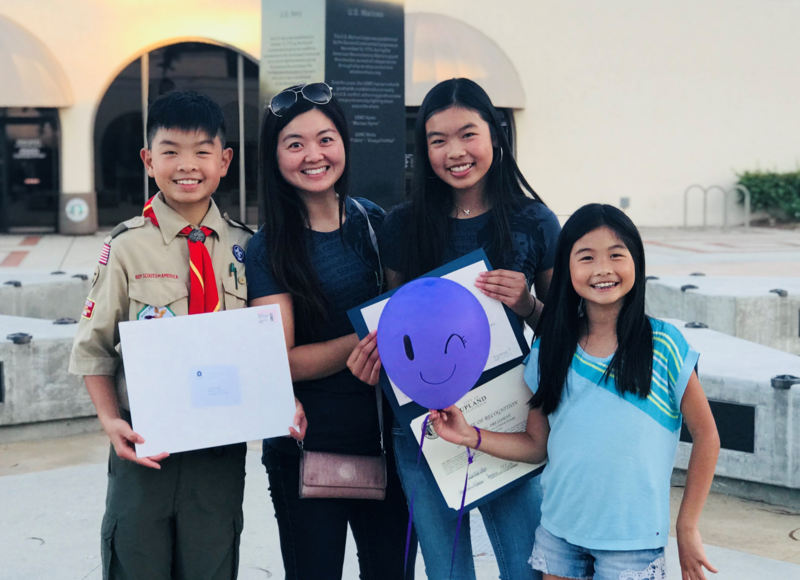 To celebrate this wonderful achievement, we invited all of our volunteers to join us at the Foundation headquarters in the Claremont Village for a night of celebration, acknowledgement and togetherness. 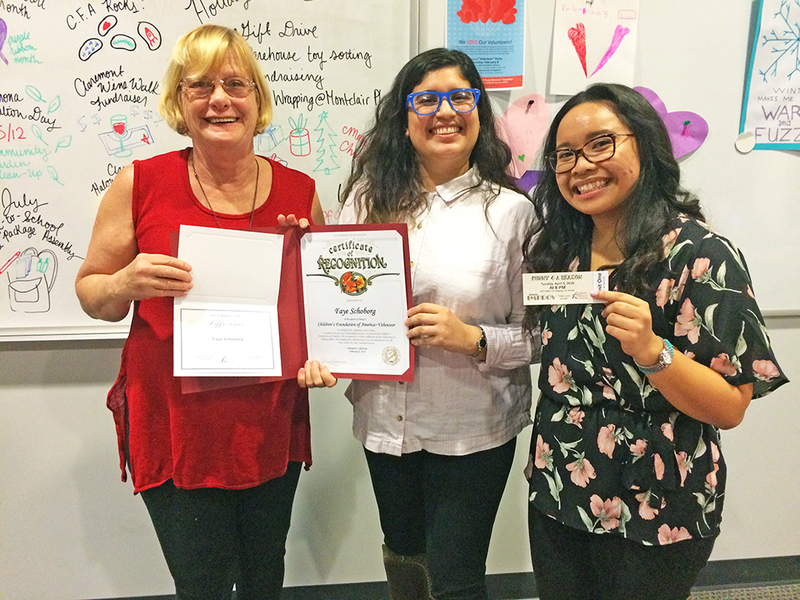 Community Outreach Coordinator, Rebecca Ustrell and AmeriCorps VIP Fellow, Marie Maghuyop, presented awards to individuals like Faye Schoborg (pictured above), who volunteered multiple times last year. 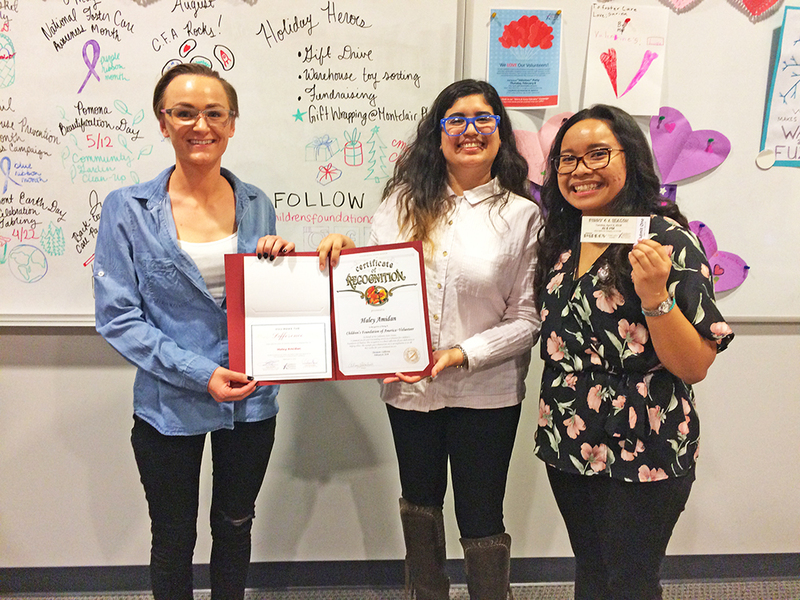 The awardees received special certificates from the Foundation, Senator Anthony J. Portantino and a free ticket to our comedy benefit show, Funny 4 A Reason. As a fun activity for volunteers, we asked them to bring books to donate as part of our “Warm & Fuzzy February” campaign. Volunteers who participated were entered into our raffle drawing for some great prizes. 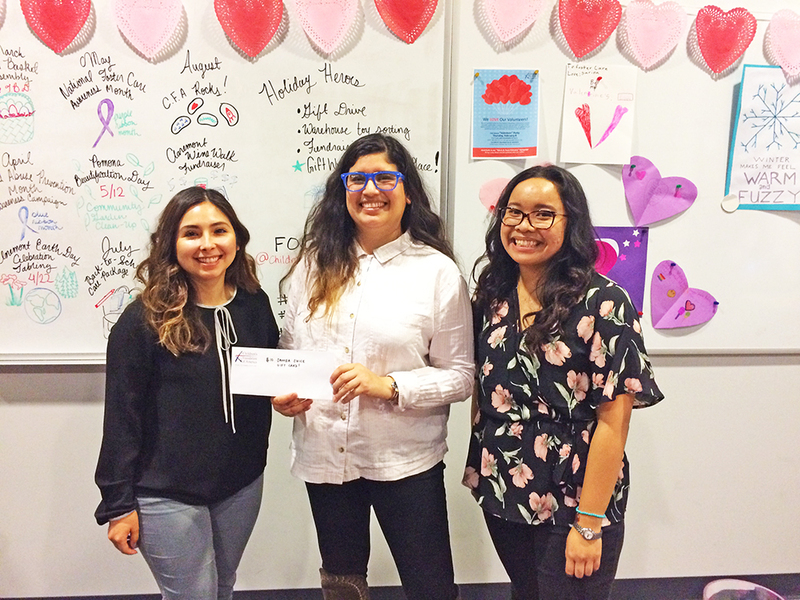 Delilah DeBellis, one of our consistent volunteers, won a $10 Jamba Juice gift card, Jayme Ramirez from Claremont Smile Design won 2 tickets to Funny 4 A Reason and Jose Briseno won a Horn Blower dinner coupon! 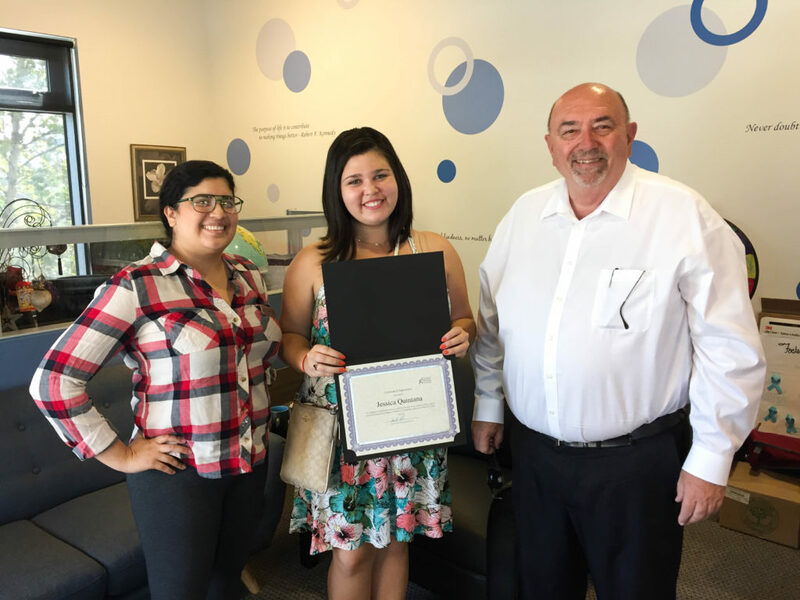 Haley Amidan frequently volunteers with the Foundation and we gave her special recognition for recently getting hired at our partner organization Trinity Youth Services. She will be part of the Trinity El Monte residential therapeutic program support team. Haley was interested in volunteering and working with youth in foster care as a result of the trauma she experience in her youth. “I don’t know what would have happened to me if I stayed in the situation I was in. Now, I want to help other kids find their way and heal from their pasts,” she said. 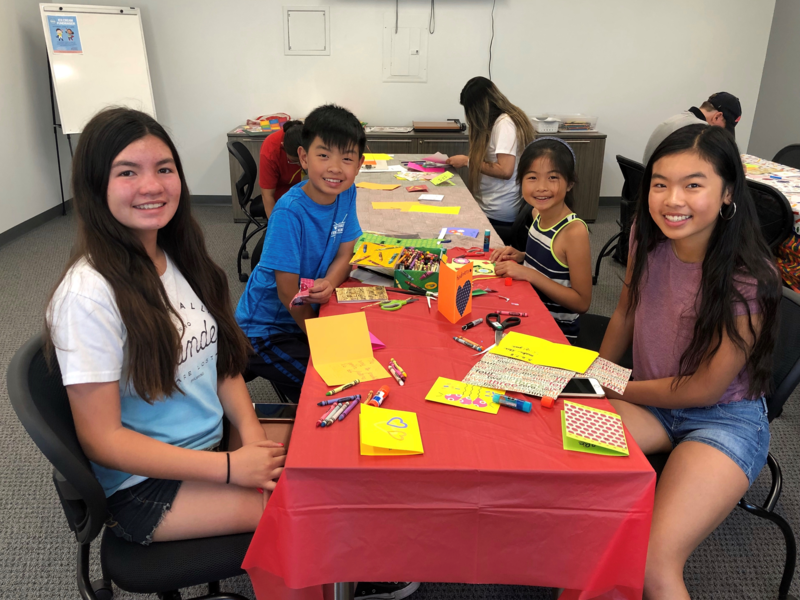 At the end of our event, representatives from Claremont Smile Design presented the Foundation with materials to help our volunteers continue to make blankets for our “Warm & Fuzzy February” campaign and dental hygiene kits and books for children in foster care. It is our devoted volunteers and supporters who truly make the difference for children in need and we are so grateful to everyone who invests in the future of these children. If you would like to volunteer with the Children’s Foundation of America, check out our upcoming volunteer opportunities here. Becky acts as liaison for Children’s Foundation of America. On any given day she could be meeting with potential donors, coordinating a fundraising event, recruiting volunteers and forming partnerships with other nonprofits that can benefit from the help of our Foundation. Becky is currently studying sociology as well as fine art and helps organize the Claremont Art Walk. 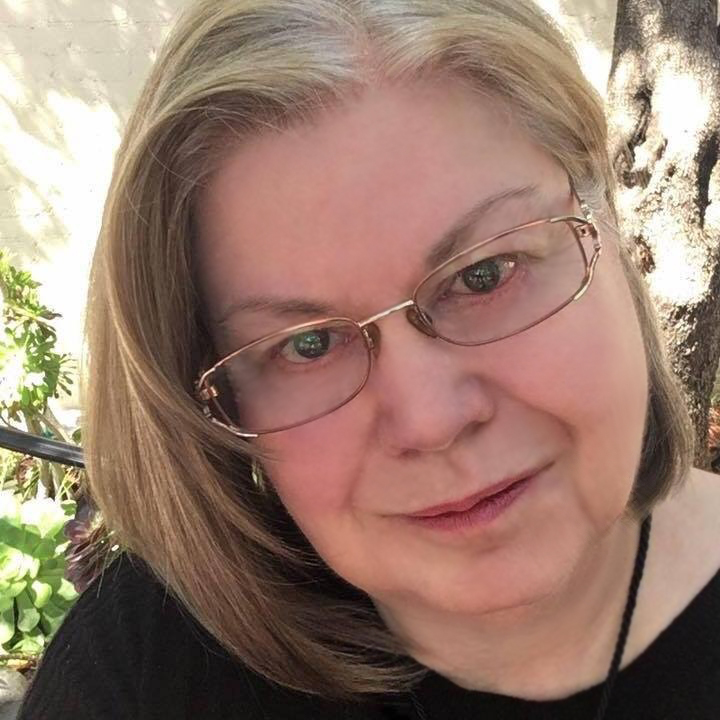 You will most likely find Becky working on freelance illustrations, playing the cello, mingling at a chamber of commerce event or volunteering in the community. Above: John Neiuber, CEO; Susan Lominska, Claremont United Church of Christ; Paola Ipucha and Rosemary Rodriguez, Advantage Resourcing; Brisa and Mario Sifuentes, Claremont Little Free Library; Jenelle Rensch, Development Specialist; and Rebecca Ustrell, Community Outreach Coordinator. In order to meet the goals within our mission, we require support in many forms throughout the year. Whether it be a short term volunteer opportunity, or a long term campaign, the team at CFA ensures the success of meeting our goals by reaching out to individuals, companies, and like-minded organizations for this support. Having been met with an overwhelming amount of support for our recent Back-to-School Drive, we decided to show our appreciation by inviting our supporters and volunteers for a coffee meet and greet with our CEO, John Neiuber on September 5 and 8 at Children’s Foundation of America headquarters in the Claremont Village. Above: Development Specialist, Jenelle Rensch, donated sweets for our guests. Local volunteers and supporters enjoyed donuts and coffee with the team at CFA. 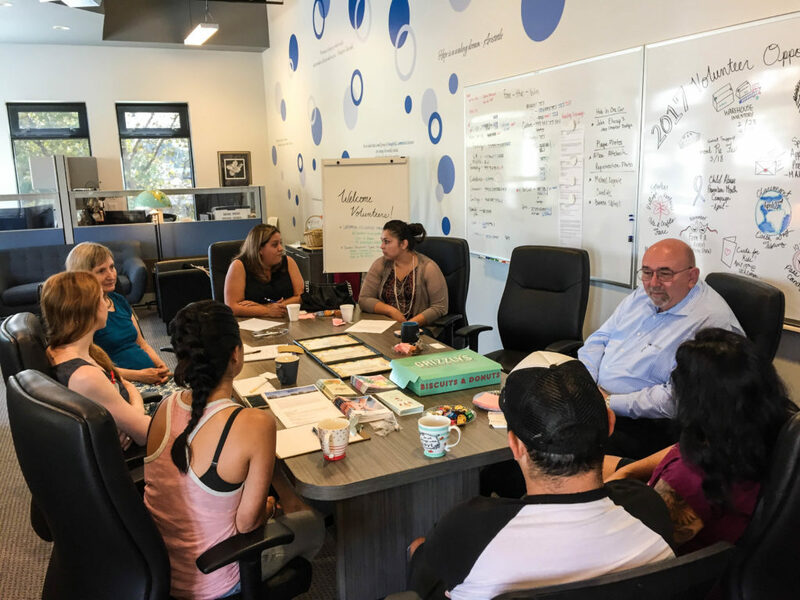 Supporters and volunteers had an opportunity to discuss upcoming volunteer opportunities and fundraisers, as well have an in depth discussion with our team about how their support has helped children in foster care, residential treatment, and shelters throughout Southern California. Each supporter was then awarded with a certificate of appreciation for their recent efforts. Keeping our goals on track also requires long term dedication from committed volunteer leaders and partnerships. 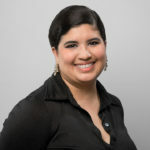 We wanted to give a special thank you to our volunteer leader, Jessica Quintana, before we bid her farewell to her new job in the Bay Area. CEO John Neiuber presented Jessica with a certificate for her dedicated work to children in need. 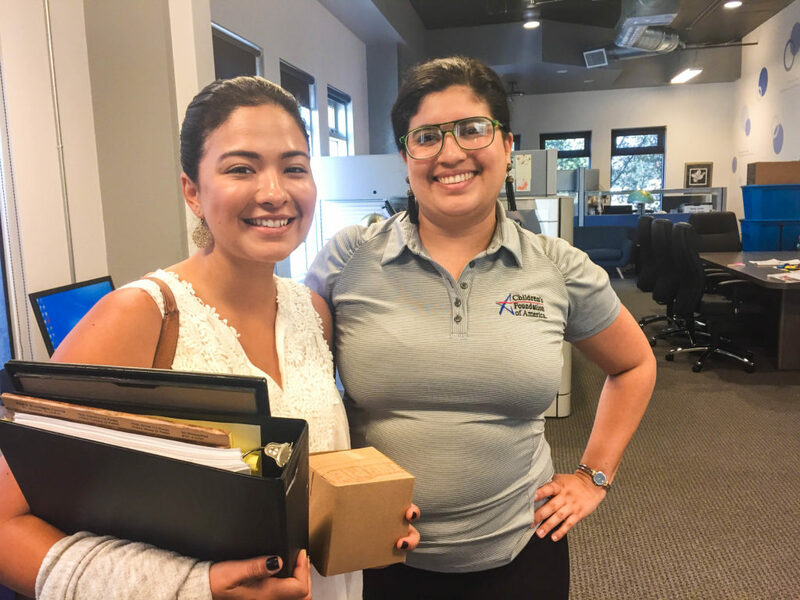 We also wanted to give a very special thank you to our Americorps VIP Fellow, Sasha Chavez, for ensuring the success of our volunteer program and fundraising efforts throughout the summer. Our staff took Sasha out to lunch and gifted her with a mini pie adorned with a pastry CFA star. 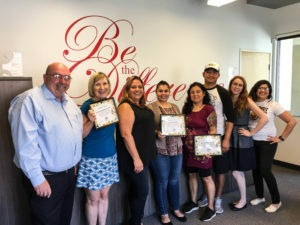 We are so grateful to those who support us in fulfilling our mission to “provide an opportunity for every person to help children heal, learn and thrive.” Though we are sad to see some of our volunteers move on, we are so proud of the accomplishments they have achieved and wish them well as they continue to “be the difference” wherever they go!